Did you know that EVERY line, wrinkle, mole and crease means something on your face? It's true. Every part of your face is connected to another organ or part of your body. What we call "aging" is not normal; every wrinkle and spot means something. Your face is connected to organs and if they're not functioning properly, it will show up on your face. Forget plastic surgery - you can do it yourself. Animals in the wild do not look old. They look healthy and active up until death. Think about what they eat in the wild. They consume fresh water, plants, fish and veggies. If you are 50 and want to assume that weight gain, gray hair, liver spots and poor energy levels are an inevitable part of aging, then chances are you have already believed the aging myth and are allowing yourself to age. What we call "aging" is not really natural. They are signs that something is not healthy or balanced in our life and body. They are wake up calls. They are signals. If we don't listen to them, we spend the last half of our lives slowly dying and becoming unattractive. This does NOT have to happen. Learn more by picking up your copy of this ground breaking eBook, "Heal Your Face" by anti-aging expert Markus Rothkranz has the power to change the way you look. The main reason people age is toxicity. That’s it! The liver, colon, kidneys, lymphatic system and blood start to stagnate. Remember the skin is the largest elimination organ. For most, this starts from birth with processed commercial baby food, formula, dairy, sugar, soy, chemicals, etc. There is absolutely no other way to get healthy and have the beautiful, radiant, glowing face. If you expect to take herbs and supplements, without changing your lifestyle and the way you eat, you are wasting your time. 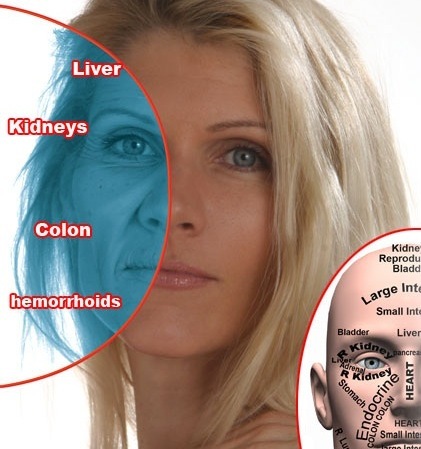 If your organs are blocked, clogged with mucus and you are suffocating from the inside out, your colon has old crusted plaque blocking absorption of all your nutrients, no herb or supplement is going to save you. You need to detox, eat higher quality, whole foods, exercise, get some daily sunshine, get quality water with minerals, detox again, then exercise some more. Once you have made these changes, watch the magic of herbs take you to amazing, vibrant health. Try to avoid these things will damage your skin, your organs and your health. Read labels on cosmetics, hygiene products and all bath and beauty products. They are mainly all toxic. Try to buy a natural body soaps, moisturizers and haircare products. Try to avoid products that contain: Parabens, Artificial Fragrances, Artificial Colors, Formaldehyde, Phenols, Trichlorethane, BHT/BHA, Glycols (Like propylene glycol), Sodium Lauryl Sulfate, Nitrates and Nitrosamines. * Hair dyes are loaded with chemicals and toxic to the liver and have cancer causing chemicals. Look for all natural Henna hair dyes by Morrocco Method. Minerals - What is your skin composed of? Water, minerals and amino acids. So put Adya in your minerals and/or take some extra Omica fulvic minerals. This will keep you hydrated and stop that dry, aging looking skin. Specific minerals you can take as supplements are listed below. MSM – Your skin loves MSM, or Sulfur and it's the foundation for all beauty. Sulfur is one of the main building blocks for collagen, hair, skin, nails, joints, ligaments, bones and all tissues in the body. It makes the cells permeable, so nutrients get into the cells and and toxins are forced out. MSM can also help athletes recover 75% more quickly. Take 1-2 tablespoons each day or 1,000 mg daily of MSM. It helps with the formation of collagen, keeping the skin elastic and flexible. It also assists in the repair of damaged tissues and alleviates pains in the body such as joint pain. Silica – Hair, skin and nails. Silica is a critical component of healthy skin, bones, joints and ligaments as well. The highest herbal sources are bamboo, nettles and horsetail and it is one of the secrets of the beautiful slow aging of the Asian culture. Bentonite Clay – This type of clay is what they use in top spas that costs a fortune. However, you can create your own spa clay almost free. Take Bentonite clay, mix with aloe vera juice or apple cider vinegar for an amazing face mask. This will pull toxins directly out of the pores of your skin. Essential Fatty Acids – Omega 6. When it comes to skin health, you need the Omega 6 more than the Omega 3’s. Hemp, Sunflower, Pumpkin, Sesame and other oils. A survey of people taking the Udo’s 3-6-9 Oil said the #1 benefit they noticed from the oils was healthy glowing skin! Coconut oil - Simply amazing for healthy skin! You will see it many natural beauty products and all natural sunscreens. Extra virgin Coconut oil, is so verstile and can be used for so many things. Use it detox daily and get that glow from within, by taking 1-3 Tbsp. of coconut oil per day. Add it in smoothies, on toast, or replace your cooking oil or butter with it. You can also use it as a beauty product too! Use it as an all over facial and body moisturizer, to treat acne by dabbing a small amount to the effected area or as a hair treatment for dry hair. Greens – Greens detoxify and purify the bloodstream. Healthy blood = healthy skin. So make a green smoothie every day or take a good greens powder in water early in the morning. Try to eat a vegetable with every meal if possible. Astaxanthin and Chocolate – You need potent antioxidants for radiant skin health! Astaxanthin is powerful and regenerates skin, helps cells to replicate properly, supports collagen structure, elasticity, firmness, less sagging of the skin, wrinkles, improves hydration and moisture. Protect your skin from sun damage with antioxidants as well. Raw Cacao is super high in anti-oxidants. Aloe Vera Juice – This stuff is a miracle beauty product! Amazing for the face. It's incredibly healing on the inside of our body as well. It heals the colon and protects from colon cancer and polyps. Vitamin C – A critical component of the collagen matrix. Highest sources are from berries like camu camu, amla and acerola cherries. Take a multi-vitamin or a separate Vitamin C supplement with at least 500mg daily. Bee products – Well documented as Cleopatra's beauty secret! Honey, bee pollen and royal jelly are loaded with nutrition and amazing for your health! You can put honey on blemishes on your face and it will heal wounds and even help with scarring. Consuming Royal Jelly is phenomenal for hormone balancing, and boosting the adrenals and thyroid gland. Try Egyptian Magic Healing Cream. An all natural healing cream and moisturizer balm for face, body and hair. Made with wholesome, natural ingredients like: Olive Oil, Bees Wax, Honey, Bee Pollen, Royal Jelly & Propolis Extract. Also great for a hair mask, acne, scraps, burns, cuts, diaper rash, babies, kids and the entire family.